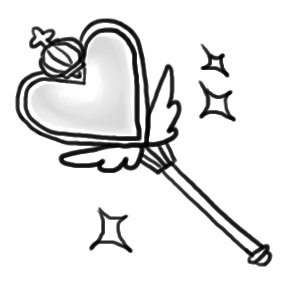 The wand.drawing module provides some basic drawing functions. wand.drawing.Drawing object buffers instructions for drawing shapes into images, and then it can draw these shapes into zero or more images. Arcs can be drawn by using arc() method. You’ll need to define three pairs of (x, y) coordinates. First & second pair of coordinates will be the minimum bounding rectangle, and the last pair define the starting & ending degree. You can draw bezier curves using bezier() method. This method requires at least four points to determine a bezier curve. Given as a list of (x, y) coordinates. The first & last pair of coordinates are treated as start & end, and the second & third pair of coordinates act as controls. You can draw with colors directly on the coordinate system of an image. Define which color to set by setting fill_color. The behavior of color() is controlled by setting one of PAINT_METHOD_TYPES paint methods. 'point' alters a single pixel. 'replace' swaps on color for another. Threshold is influenced by fuzz. 'floodfill' fills area of a color influenced by fuzz. 'filltoborder' fills area of a color until border defined by border_color. 'reset' replaces the whole image to a single color. The matte() method is identical to the color() method above, but alters the alpha channel of the color area selected. Colors can be manipulated, but not replaced. Similar to composite_channel(), this composite() method will render a given image on top of the drawing subject image following the COMPOSITE_OPERATORS options. An compositing image must be given with a destination top, left, width, and height values. Ellipse can be drawn by using the ellipse() method. Like drawing circles, the ellipse requires a origin point, however, a pair of (x, y) radius are used in relationship to the origin coordinate. By default a complete “closed” ellipse is drawn. To draw a partial ellipse, provide a pair of starting & ending degrees as the third parameter. path_close() draws a path from last point to first. path_curve() draws a cubic bezier curve. path_curve_to_quadratic_bezier() draws a quadratic bezier curve. path_elliptic_arc() draws an elliptical arc. path_horizontal_line() draws a horizontal line. path_line() draws a line path. path_move() adjust current point without drawing. path_vertical_line() draws a vertical line. Each path method expects a destination point, and will draw from the current point to the new point. The destination point will become the new current point for the next applied path method. Destination points are given in the form of (x, y) coordinates to the to parameter, and can by relative or absolute to the current point by setting the relative flag. The path_curve() and path_curve_to_quadratic_bezier() expect additional control points, and can complement previous drawn curves by setting a smooth flag. When the smooth flag is set to True the first control point is assumed to be the reflection of the last defined control point. You can draw points by using point() method. It simply takes two x, y arguments for the point coordinate. Complex shapes can be created with the polygon() method. You can draw a polygon by given this method a list of points. Stroke line will automatically close between first & last point. Identical to polygon(), except polyline() will not close the stroke line between the first & last point. When working with complex vector graphics, you can use ImageMagick’s internal graphic-context stack to manage different styles & operations. The methods push(), push_clip_path(), push_defs(), and push_pattern() are used to mark the beginning of a sub-routine. The clip path & pattern methods take a name based identifier argument, and can be referenced at a latter point with clip_path, or set_fill_pattern_url() / set_stroke_pattern_url() respectively. With stack management, pop() is used to mark the end of a sub-routine, and return the graphical context to its pervious state before push() was invoked. Methods pop_clip_path(), pop_defs(), and pop_pattern() exist to match there pop counterparts. Support for rounded corners was added in version 0.4.0. The radius argument sets corner rounding. Both horizontal & vertical can be set independently with xradius & yradius respectively. The Drawing class, by nature, doesn’t implement any form of word-wrapping, and users of the wand library would be responsible for implementing this behavior unique to their business requirements. 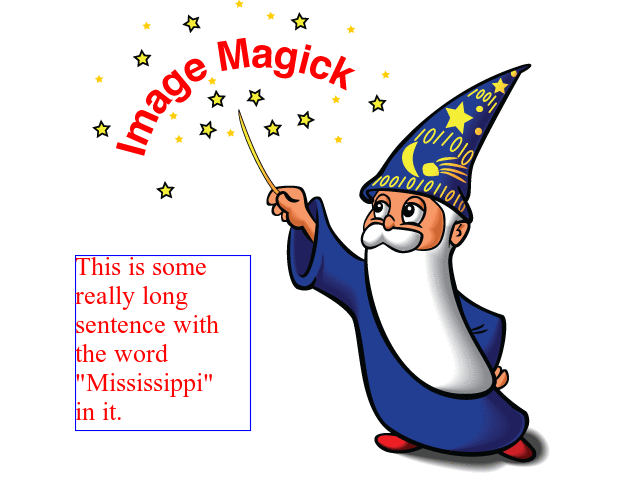 ImageMagick’s caption: coder does offer a word-wrapping solution with Image.caption() method, but Python’s textwrap is a little more sophisticated. our region of intrest is.""" until all text fits within a bounding box.""" """Quick helper function to calculate width/height of text.""" """Reduce point-size & restore original text"""